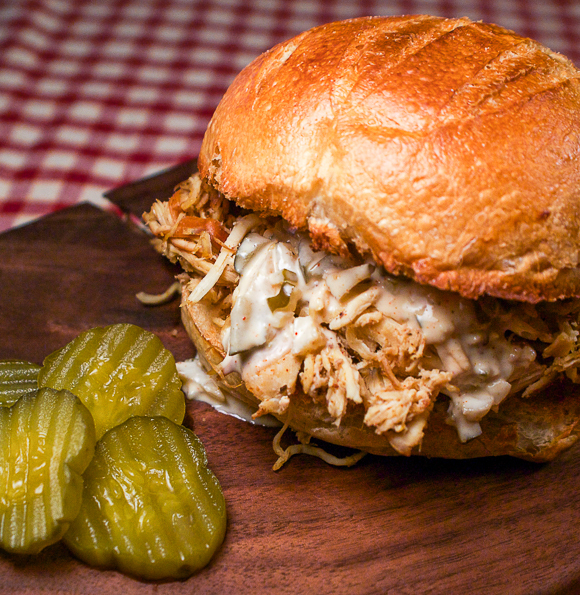 Alabama meets Tennessee in this Pulled Chicken BBQ Sandwich with Alabama White BBQ Sauce. As chicken in all its forms nudges past pork at restaurants all over Nashville, then pulled chicken might be the new barbecue. Better yet, you can make it easily at home. Smoky chicken pulls apart just as nicely as a pork shoulder, and in less time. Dark meat thighs offer the most barbecue flavor, but use whatever you like. 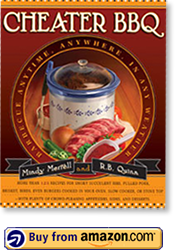 Indoor barbecue starts with the slow cooker. It is perfectly designed to deliver low, steady heat that will gently break down muscle fiber, transforming it into soft, tender, juicy meat. And unlike traditional barbecue, it doesn’t need your attention. Plug it in and go do something else. Your indoor barbecue is in good hands. Next, your home kitchen smoking system requires all-natural liquid smoke, that little brown bottle next to marinades and barbecue sauces in the supermarket. While long misunderstood by barbecue purists, liquid smoke is a very cool and widely used ingredient. You’ll really be surprised by how good it smells in the kitchen. You might think you’ve never had it, but you have. Liquid smoke is all foods with “natural smoke flavor” on the label. Use whatever brand you like. They’re all based on naturally condensed smoke particles made from smoldering wood with carcinogens and impurities removed. Yes, liquid smoke is healthier than your outdoor contraption. All you need now is a little dry rub seasoning blend and a good homemade barbecue sauce. For barbecue we keep to a simple rub using basic pantry staples—salt, pepper, paprika and garlic powder. Just mix them up and sprinkle it over the meat. For the sauce, we’re going with a Nashville take on the famed mayonnaise-based Northern Alabama white barbecue sauce. We’re employing the perfect accessory to pulled pork and Nashville hot chicken–the dill pickle chip (and some pickle juice). Its tangy edge balances the creaminess of the mayonnaise and distributes the pickle throughout the whole sandwich. Make the sauce as hot or not as you like. Place the chicken in a medium to large slow cooker. Pour the liquid smoke over the chicken. Mix up the salt, pepper, paprika and garlic powder in a small bowl and sprinkle it over the chicken. Cover the slow cooker and cook the chicken on HIGH about 3 or 4 hours or on LOW 6 to 8 hours. When fully cooked, the meat will easily pull apart when pierced with a fork. Remove the meat (and bones if any) from the cooker and shred/pull apart with two forks. Return the meat to the cooker with the juices and turn the dial to LOW or WARM and serve. To make the sauce, combine all the ingredients in a bowl and mix well. 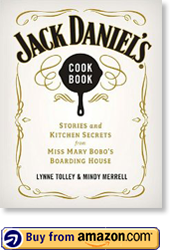 Serve the pulled chicken on warmed hamburger buns or warmed hot dog buns cut in half for appetizer/party-size bites. Drizzle the sauce over the meat in the sandwiches. Note: If you don’t have a slow cooker, combine the meat and seasonings in a covered Dutch oven or foil pan tightly covered with foil and cook it in the oven at 300 degrees for four hours or until pull-apart tender. Serve as above.